Hurray! It’s the week everyone’s been waiting for, the 14th – 20th October, AKA: National Chocolate Week! 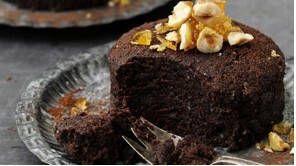 What more of an excuse do you need to relax, have fun, get messy and indulge in some chocolate baking? Shops will be getting into the swing of things with special products and having great offers on chocolate delights. Restaurants and cafes will also be holding themed chocolate events and tasters so don’t miss out! 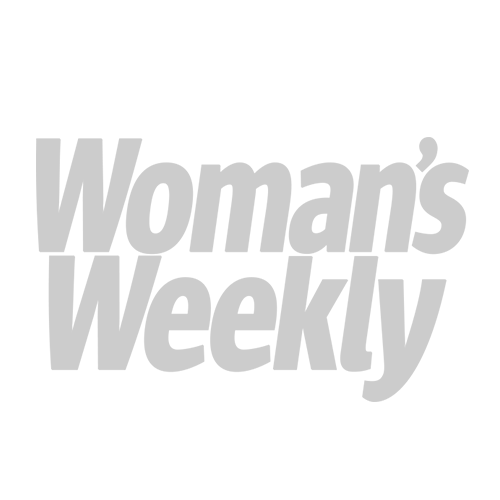 So why do we all (well…most of us!) love chocolate? In fact, science plays a major part. Chocolate has generally always been associated with love, this is because chocolate contains Phenylethylamine & Sereotonin, both human hormones that naturally occur in the brain. These hormones are mood lifting, and are released into the nervous system when we are happy and are feeling passionate. This process naturally causes the blood pressure to slightly rise and increase our heart rate and creates an all -round well – being. Concluding, when we feel low we reach for the chocolate. Before you start getting creative with your chocolate, let’s go over a few pointers when cooking with chocolate. Firstly, choose the highest quality chocolate you can get, the reason being is they have higher cocoa solids content (dark chocolate around 70%, whereas milk being 40%). When melting chocolate, take your time. 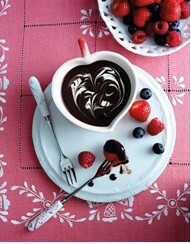 Go nice and slow over a hot pan of water, taking care the chocolate does not split. If you want to use a microwave I suggest heating it up in 30 second bursts at a time, preventing it burning. One of the first things that springs to my mind when I think of chocolate recipes is a good brownie. Who doesn’t love a good brownie? This recipe is a classic and easy to follow. It specifically uses Cadburys Bornville Chocolate and Bornville Cocoa Powder. I definitely recommend this one for the kids as well. For the full recipe see here. Here we have an easy beginners recipe that is a must try. With three types of chocolate you can’t go wrong. These are American style soft, chewy cookies. It is the perfect cookie recipe you have been waiting for that will always leave you wanting more. 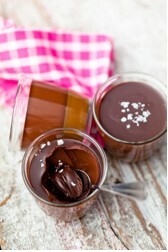 Using high quality dark chocolate, 4 eggs, flour, sugar and coffee, these little pots are pure indulgence. Impress your friends and family by serving them in individual ramekins straight from the oven after dinner. Inflict a slight puncture in the middle and fill with fresh cold pouring cream. The combination of gooey warm centre & cold pouring cream is a favourite in many types of puddings. A very grown – up cake that takes two of the greatest things in life and makes a cake that is incredibly moist, but easy to make. 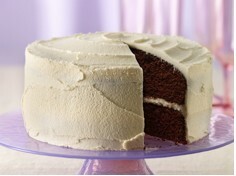 Originally created in America using Cola, this cake has been adapted and has been made using a good quality cider or ale. This simple but effective dessert will get the conversation going and the fun flowing after diner. Let your guests help themselves to a selection of fresh fruit, biscuits, doughnuts, fudge and let them dunk away in this tempting warm chocolate fondue. Not only is this a great idea at dinner parties, but a very fun idea at a child’s birthday party. One of my favourites here on woman’s weekly, this luxurious dessert is a modern twist on a chocolate classic. A rich layer of creamy chocolate hides a secret smooth caramel under layer, salt and sweet…the perfect combination. Now more than ever, recipes are being developed so that everyone can enjoy them. Just because you have an allergy doesn’t mean you have to miss out anymore. 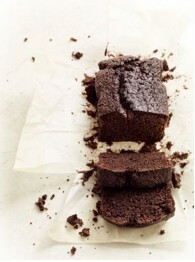 This is the perfect gluten free classic chocolate cake recipe, not to be missed. And finally, a three bowl chocolate baking challenge. Allegra McEverdy is the co-founder of a leading healthy fast food group Leon. Allegra created this dessert for Divine & National Chocolate week. Take your time over this recipe…are you up for the challenge? For the full recipe see here. Are you all out of chocolate yet? No? 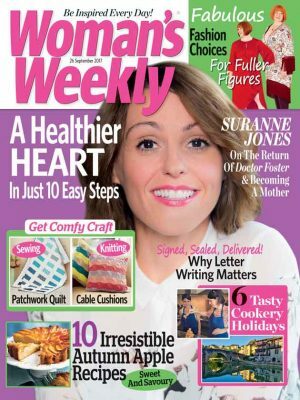 Well why not check out the new Woman’s Weekly chocolate magazine for lots more tempting recipes: https://www.womansweekly.com/food/new-chocolate-magazine/. Author Emma Thompson loves baking and cooking up new things in the kitchen. She often writes for MakeBake where you can get all sorts of cake decorating supplies. Emma especially loves chocolate, which is why writing this post was a treat!